Nobuyasu Kaji became the editor in chief for Option2 Magazine in 2001. He is a type of person who takes interest in many things and loves to do everything himself. (Although sometimes he sticks his neck into people’s business) His personal vehicle is a 600 hp JZA70 Supra and a Nissan van converted to a mini Hummer which he takes great pride in. There are lots of ways to have fun modifying a car. There are those who like to make their car go fast, and those who like to make their car look good. I like to have fun modifying my car the way I want it to be. I think about how to fix up my car all the time, whether I'm driving or editing a document, it doesn't matter. Very often, I try and install the parts that I buy by myself. The reason why I became so fond of DIY projects is probably because it requires help from good friends. If you don't have good friends, it's very important to find some. For those who are already blessed with good friends, your network of friends will soon expand. It's like a hobby that unites, or a common interest that gathers people. Inside that network of car lovers, there will surely be guys who are into racing, or guys that are into exterior enhancements, or even people that are into DIY! You never know what kind of friendship will bloom. There’s also a possibility that the person you purchased a used car part from one day may become one of your closest car buddy. It's evidently clear that a hobby becomes more fun as more people get involved. When approaching at an obstacle while working on your car, don't give up! Don't agonize over the problem, get some help. Call the local tuning shops and demand for help! (don't be discouraged if they won't help you either) The internet works wonders these days as well. Back in the days when I too, was a loyal Option reader, used to call up the tuning shops many many times for help. I now thank those shops who have unselfishly helped me out instead of choosing to ignore me. One of the biggest assignments that the Option2 editorial team is concentrating on these days is the DIY (Do It Yourself) projects. Our editorial staff here is made up of guys/gals who have experience in racing and they also love to customize cars with their own hands. Our policy here is to do everything ourselves. Trying everything your self has a lot of merit and fun factors involved. To sum things up, if the project seems too difficult or you lack the tools to finish the project, you should seek help from a professional. Remember, DIY should be fun! Start things off with the simple projects! These are Snap-On hand tools which are very easy to use. Although these are cool to have, they are not necessary to have at the beginning. It is best to keep your expectations realistic. (BTW: Kaji has a very expensive Snap-On set just sitting in his room, and uses the generic set he bought while in college) Even a difficult DIY project can be fun when done with lots of good friends. The photo was taken before Kaji became the chief editor. The project was "DIY engine swap". Starting from the left, Kentaro (deputy editor of OPTION), Kaji (chief editor of OPTION2), Riko (deputy editor of OPTION2), Gods Nakamura (president of MSG Active), and Noborucchi (chief editor of JDM-OPTION). The vehicle used at this project was a Nissan S13 Silvia. 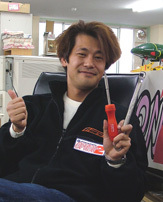 Bomber Yamamoto, who stars in the weblog of the JDM website is also a former racing team mechanic. He earns his living as a MC these days. Lately, Bomber has been giving us a hand with our DIY projects since he too, loves DIY. Check out Option2 for details. Finally the "DIY handbook", a special issue of OPTION2 was published. It was a significant achievement with Bomber Yamamoto's help. The contents show the steps of installation for various DIY projects. Useful info such as modifying a car to drift is featured. Whether it's driving or customizing, the more people there is the merrier. At the Sunday races, we perform everything from the maintenance, tuning, and driving. We also get to test and tune our very own parts. Kaji may not be the best driver, but loves to be a part of the crew.